Chaamp is a bengali movie of 2017 directed by Raj Chakraborty. The movie stars Dev, Rukmini Maitra, Priyanka Sarkar. 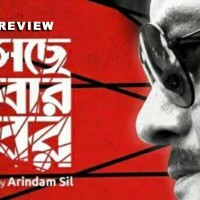 Bengali Movie Review, Chaamp Movie Review, Chaamp Bengali Movie Review. New comer Akbar Hasan, who is pitted against Dev in a negative role as boxer Prashant Singh is a close friend so I will address the elephant in the room first and put a disclaimer that the review is purely incidental and is not influenced by any personal rapport. That said - this is the first major outing as an actor for Akbar, a known face as a model. Compared to Dev – who has a much better screen time and screen presence – Akbar manages to hold on his own in the three scenes where he is present – entry, confrontation and defeat which together lasts for about three minutes. However, as Dev’s opponent Prashant Singh, his presence looms large in the film. As a debutante, Akbar is a promising entertainer but needs to work on his skills as an actor if he wants to continue in this field. Coming to the next debutante, Rukmini Maitra – who is also a model turned actress – it is good to see a fresh face emerging in the Tollywood landscape. According to reports, she was always wary of getting into films but her fears can now be put to rest as she delivers a believable character, Jaya as Chaamp Shivaji Sanyal’s better half. She looks good, her chemistry with her real life beau neither overpowering nor undermining their scenes together. Rukmini looks matured and sophisticated which most heroines in Tollywood take years to learn. So, I hope she is here to stay. Three other major characters in the film – Chiranjeet as Shibaji’s “Old Man” coach, Laboni Sarkar as the quintessential mother and Priyanka Sarkar as Shivaji’s cheerleader play stock characters - nothing surprising about them and they deliver what they have been told to do. Their characters are not fleshed out at all and they are there to foil the lead role – that of Shivaji Sanyal. As the titular character, Chaamp is for, of and by Dev. Apart from Rukmini, all the characters are one dimensional and exist only to enhance the life of Shivaji, who accidentally discovers a pair of boxing gloves as a young boy and begins to harbour dreams of being a boxer. He hails from a poor family from Purulia and is spotted by “Old Man” coach who takes him to Kolkata to give him a bigger platform. Shivaji first becomes successful, then he becomes arrogant and then he falls flat on his face and then again he emerges as the Chaamp. The maths is very clear and predictable. Dev is not celebrated as an actor so there is nothing new to add there. The only silver lining is – with age he is comparatively getting better if that is possible but what makes him stand out in this film is Dev the producer and storyteller. 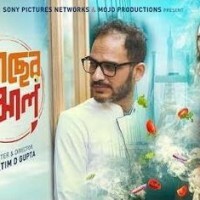 Director Raj Chakraborty and producer Dev manage to make a typical Bengali tear-jerker with “rags to riches to rags to riches” framework which has got nothing to do with sports and everything to do with sentiments. Raj keeps the familiar emotions and narrative in in the box with no catharsis for someone like me, who is surely not the audience in mind. Here let me tell you one incident. While I had a beer and two cocktails (Classic Martini and Caprioska) before entering the movie hall so that I could trance out, the lady sitting next to me and the gentleman sitting next to my companion were actually crying, wiping away their tears and rooting for Dev’s Shivaji Sanyal as if their own life depended on his success. Whenever villain Prashant Singh came on the screen we jumped with glee and the lady turned to look at me as if we were the criminals! If this is the audience that team Chaamp wants to please, then more power to them. But one day, I hope, the same team churns out something to please me too. I love Tollywood.